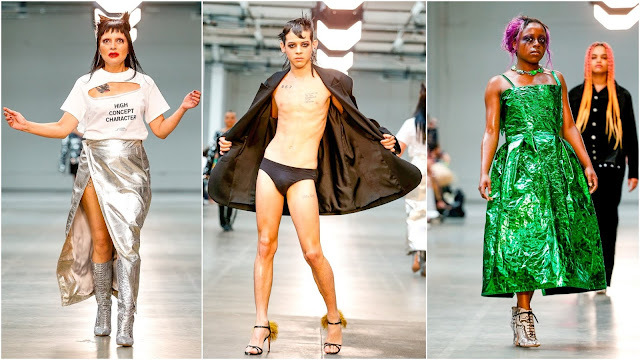 On Sunday at London Fashion Week Men’s there was a fake-blood-lathered naked man manoeuvring a smashed crate, male models cradling prosthetic baby bumps, and campy characters thrashing convulsively on the runway. That was all before 1pm. The naked man covered in paint appeared at Samuel Ross’ A-COLD-WALL* show, which was attended by impresario Virgil Abloh. Having been recently nominated for the LVMH Prize and secured investment from Tomorrow London, high-level editors and buyers flocked to the Old Truman Brewery for an unforgettable multidisciplinary spectacle. First emerged the pewter-hued detachable-hood-wearing soldiers in uniform procession. Second came the models attired in conceptual streetwear that presented an alternate vision for the future of men’s fashion. Ross was thinking about brutalist British architecture and the working class milieu he grew up in, before breaking into the fashion world. The polystyrene crate his soldiers transported around the catwalk before physically breaking down the walls of it, with a naked man covered in blood symbolising “rebirth” emerging. Perhaps it was a metaphor for the post-LVMH Prize nomination prosperity he’s sure to relish in? It could’ve alluded to the rebirth of streetwear—for once, someone was contributing something to the most overwrought dialogue in men’s fashion. Or even, on a personal level, it was about his transcendence of social framework—from a council estate to the fashion industry. The spectacle veritably outshone the exceptional quality of this season’s clothes but I think his loyal fanbase will buy into his vision regardless. His ability to merge the worlds of architecture and fashion and create a poetic haute street wear is a testament to his talent. Utility is the name of the game in menswear and he elevated that here with fabric innovation and technical prowess. Xander Zhou was the proponent of paternal pregnancy. Extraterrestrial or futurist visionary? One look with prosthetic hands extending every which way reminded one of a multi-limbed deity. Zhou is good at what he does. He knows how to create a desirable garment but his mind seems to jump from thought to thought each season. There’s never really any connection. There are great clothes but it lacks a coherent vision which is alienating. A discernible brand identity would help him go the extra mile. The pregnant male models unfortunately eclipsed the clothes which ranged from 90s-tinged futurism, the highlight being striped rugby shirts. Eden Loweth and Tom Barratt’s final display as part of Fashion East’s Man collective with their Art School project was a high-octane queer drama. Disseminating ideals about gender fluidity, campness and queer culture, they received help from characters including transgender model Munroe Bergdorf and DJ Princess Julia. They command London fashion’s dialogue with queer culture, servicing the hallowed ground of Sebastian Pieter, and the ill-fated Meadham Kirchhoff, both of whom have dropped off the schedule in recent years for one reason or another. Their models pirouetted, pivoted and preened on the runway at the Old Truman Brewery. They ran, they threw themselves on the floor in a Leigh Bowery-influenced procession, and one even laid down, kicking his stiletto heels like he was the victim of a violent attack in a French psychodrama. The clothes were their best to date but they still haven’t quite worked out how to match the calibre of their clothing with the ‘high concept character’ they select to represent their brand. In the context of the wearer, it can fall rather flat. But it’s evident progress is being made. What they have mastered is the co-existence of clothing and character, you can’t focus on one without the other. The theatrics reminded one of London Fashion Week Men’s when it began, then known as London Collections: Men. Those were the days when it was struggling to find a foothold in the men’s fashion conversation, especially alongside the venerated fashion weeks in Milan and Paris. There were shock tactics deployed to capture imaginations but what really stood out was good design. Now there's mostly just a focus on design. Momentum picked up when the industry shone a light on talents like J.W. Anderson, Grace Wales Bonner, and Craig Green who were drawing international press and buyers to London before their other European menswear obligations. But J.W. has since consolidated menswear and womenswear and switched to the womenswear schedule in February and September. Wales Bonner is sitting Spring 2019 out, opting for appointments during Paris Fashion Week in lieu of a catwalk display. Craig Green has been invited to show at Pitti Uomo, the men’s fashion fair in Florence, Italy, later this week. London’s firmly established position on the menswear calendar will extend into the future with the industry clout of talents like Samuel Ross, Xander Zhou and Eden Loweth and Tom Barratt, amongst a host of others. 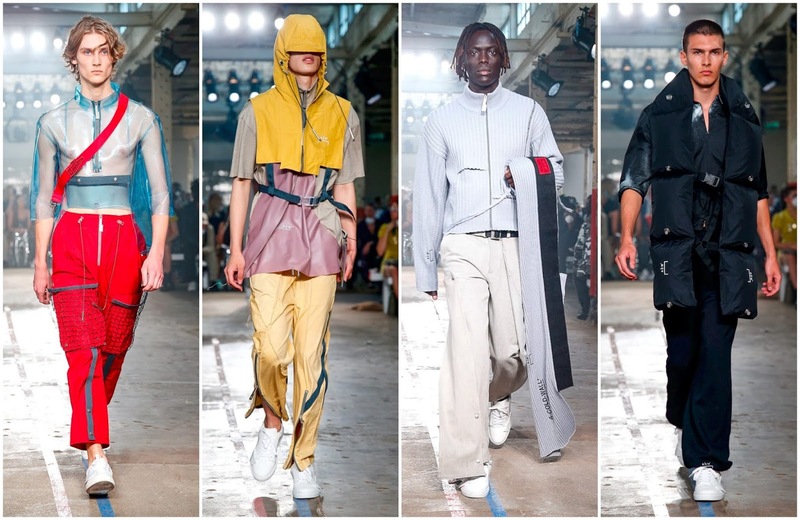 What this London Fashion Week Men’s proved is the designers are bursting with ideas and their efforts at articulating them can be both discombobulating and endearing.